Not so long ago we looked at how to send emails to cell phone as SMS for free How to Send Email to Any Cell Phone (for Free) How to Send Email to Any Cell Phone (for Free) Read More . Lots of people found the article quite useful. Today I wanted to extend it a bit further and show you how you can use the info from the previous post to setup SMS alerts for important emails that land in your Gmail account. The whole thing is fairly simple. I am pretty sure some of you have been using it already. First you need to get free email to SMS gateway for your mobile carrier How to Send Email to Any Cell Phone (for Free) How to Send Email to Any Cell Phone (for Free) Read More . If you didn’t get it last time you can easily do so now. The page lists email-to-sms gateways for 10 major US carrier and lots of international ones. Once you have the email for your mobile number (say 1234567890@tmomail.net), simply login to your Gmail account and go straight to Settings -> Filters tab. Now, there are two ways to use this. The first way is to setup SMS alerts for emails coming from certain people or places that you consider important. These can be emails from your employer, bank, hosting provider, site uptime tracker etc. Create new filter and enter the email address for which you want to receive SMS alert. In the next step, setup a Forward rule to your free email-to-sms number. Click on “Create Filter” and you’re done. Next time you receive email from that address you’ll also get SMS message with about first 150 characters of the email. As simple as that. Say you’re on holiday and don’t want to be bugged with regular work related emails. However at the same time you want to make sure that when it’s something really urgent people can reach you. Here is what you can do. First create an auto-responder message (see in Setting -> General) that looks something like the one below. Then go to ‘Filters’ tab and setup a forward filter for it. As you can see, in the above auto-responder message I provided sender with option to reach me by simply emailing me again using “urgent” in the subject line. As soon as email hits my inbox I get texted to my mobile. Are you using anything similar to that right now? Share with us in comments. Explore more about: Email Tips, Gmail, Notification, SMS. I am in Kenya and using Safaricom mobile provider. How can I do this in Malaysia ? How can i do this in Pakistan? This is great.....does anyone one the email address for the australian networks...in particular Telstra. Anyone got any info on being able to set up this txt message alert from specified email - using a New Zealand Telecom mobile? This would be Awesome to use! would save a lot of time, and would generally be very cool -but I cant see any NZ listings to set up my phone to? It is possible to get email to SMS in India. Problem doing this with US Cellular -- it attempts to send the entire message of the email in packets of 160 characters, so a long email gets you multiple text messages, a big waste. Any way to just send the subject line or sender email?? Thanks. I'm not sure if this works for other carriers or not, but for large messages, i have it send it as though it were a picture message. I use cricket and instead of sending it to (mynum)@sms.mycricket.com i send it to (mynum)@mms.mycricket.com. Notice the change from sms to mms. I use this for various things, like getting alerted for weather and that. As of the time this was written, cricket still didn't support various facebook apps and alerts from weather.com. Various services will have an option of sending alerts and that to your email. Weather.com is one example. To have it go to my phone, i put (mynum)@mms.mycricket.com and it sends the whole thing in one piece, not just 160 characters of it in multiple parts. In order for this to work, you have to have picture messages included in your plan. I'm from Portugal and a use Vodafone, can i get a gmail sms alert for free? Are you sure abot this? I have been using using with T-mobile here in UK and hasnâ€™t received a single confirmation message yet. Yes, it does it with Verizon in the US. When I get an email, the sender gets a message delivery confirmation back from Verizon that contains my @vtext.com text address. As far as I know there is no way to disable it because it comes from the Verizon data network, not the handset. For you Verizon guys, I may have thought of a solution. Or I simply added a layer of stupidity to it. I can't test it, because I'm an AT&T customer. Say your address is MyAddress@gmail.com. You get an email you want to go to your phone at that address. Create a rule that sends it to MyAddress+FWD@gmail.com. With gmail accounts, you can add +whatever to your username and it will still come to your account. Then, when an email comes in with a To address of MyAddress+FWD@gmail.com, you forward THAT email to your phone. This either adds a link in the chain that goes back to the initial sender, or it started a new chain that will stop with your email. From there you can create a rule to auto-delete the response messages Verizon keeps sending, and you could also delete all messages To MyAddress+FWD@gmail.com, since these are just duplicates anyway. Michael was nearly dead on. Gmail won't allow you create a filter that forwards a message to your own Gmail account - even with a "+FWD" or whatever in the address line. The solution is to create another gmail account that you can forward to and let it alert your phone. It breaks the chain as he indicated. Worth noting that Gmail passes thru your original gmail account address on the forwarded email so just setup a filter to forward to your phone anything from your regular gmail account. I cannot do it in Vietnam. Have you got any updates for us Vietnamese here yet? Did you check earlier post for email to SMS gateways for Vietnam? I am sure there shoulf be one or two for Vietnam as well. I've tried using this before. Problem is it allows the stupid delivery message from your carrier to pass back to the original sender. Which contains the direct text address of your cell phone. That's fine for people I trust, but if someone emails me I don't like the thought of them getting a response like: "Your message to 5555551212@messaging.sprint.com was delivered". Add to that the fact that it sends that reply the instant the text hits your phone, not when you read it, so people think you read the message when you may not have, and this just doesn't work too well. 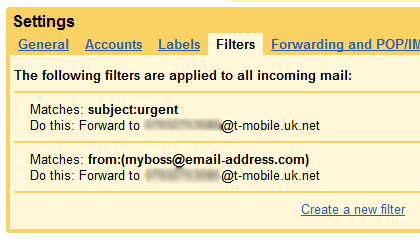 The part about filtering for just your boss or something urgent is a cool idea though. "Iâ€™ve tried using this before. Problem is it allows the stupid delivery message from your carrier to pass back to the original sender"
Are you sure abot this? I have been using using with T-mobile here in UK and hasn't received a single confirmation message yet. I don't have a data plan on my phone, and have done everything I can think of to hack my unlimited text plan to do everything I can possibly make it do. This includes Mosio, Google SMS, Facebook Mobile, Buxfer, and also the trick used above. With a method like this, I get updates every time a scheduled post goes up on my blog, and every time I have a comment that needs to be moderated. Every time my friend sends me an email, it's auto-forwarded to my phone as an SMS message, picture attachments typically included. When I get time in the future, I was considering trying to setup some AutoHotKey scripts that, when triggered by an email message (probably through Outlook), would set my computer to update or scan or whatever on remote command from my texting phone. Oh, to dream of such coolness! is sms are free ? and is this service is available in india also ? Yes, it works in India too. Just refer to the previous article to find the SMS gateway for your mobile carrier. If your mobile plan doesn't charge you for receiving SMS messages then it;sc ompletely free. Based on my experience with INdian mobile provides receiving SMS message is free. Thus using this service should be free. Fewer Mobile operators, Ask to your Network for email to sms address, I know some in India provides for free some have charges.